Christmas day, and we wake up in our fancy (that is, American-style) Pacific resort. The view is truly right out of the advertising brochure. 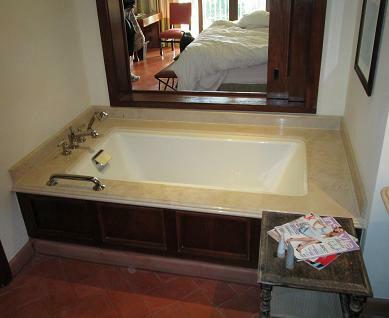 The tub in our room. It had a mountain view. The resort is very nice, very fancy, very American. All the signs are in English, everyone speaks English, they played eighties hits on the muzak (first I’d heard the Pet Shop Boys’ “Opportunities” in a long time). I found all this somewhat disappointing, because it was the sort of experience you could have without ever leaving the states, or in many cases, without leaving your hometown. I will say that, among our tour group, mine was a minority opinion. 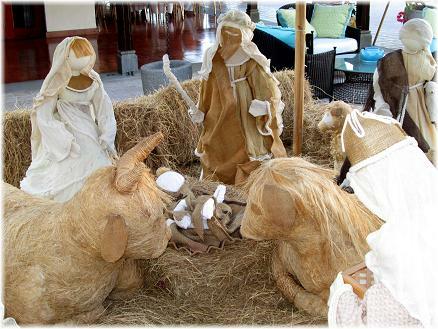 They had a very nice creche at the hotel. Quite a bit of craftsmanship went into this. It was beautiful at the beach. 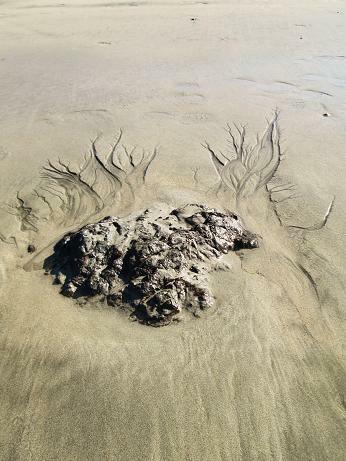 I found the wave images on the sand fascinating. And while I shot a short clip of the beach, I began to understand why so many of the men on the Bounty were willing to risk it all for this.